Perhaps one of the most beautiful flowers around is the tuberous begonia. There are many varieties, from single or double flower, ruffled-petal flowers, to camellia- or carnation-form flowers. There are even pendulous forms perfect for hanging baskets. Their colors are extremely vivid, ranging from reds and red-orange to orange, yellow, white and hot pink; there are even bi-colored varieties. The tuberous begonia is a highly versatile plant whose almost fluorescent flowers are wonderful in flowerbeds, patio containers, window boxes or even hanging baskets. Tuberous begonias will bloom for you all summer long and into early fall. Although they are not frost hardy, they can be pulled out of the ground as they start to go dormant in fall, then cleaned off and stored in a cool, dry location over winter and replanted in spring after any danger of frost is gone. Handled correctly, they can provide years of beauty in the garden. Tuberous begonias should be planted in soil that maintains moisture, but also drains (no standing water). If you plant into the ground, you may need to amend your native soil. If you are creating colorful containers, be sure to plant using a high-quality potting soil such as Kellogg® Gardner and Bloome® Potting Soil. 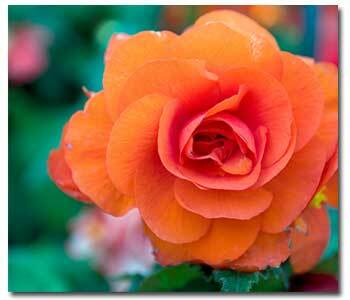 These begonias like indirect light or dappled shade locations and need to be kept moist with regular watering. Please take care not to let them dry out. To maintain their vibrant blooms, feed regularly.